What theme does Little Witch Academia explore? Anime gives me everything I want in stories and then some. One story may have compelling characters whose traits make me laugh. Another story may take on a completely different artistic style that dazzles my eyes with its strangeness. Then there could be a story that entertains me outright with moments of solid drama, crazy action, or sweet romance. 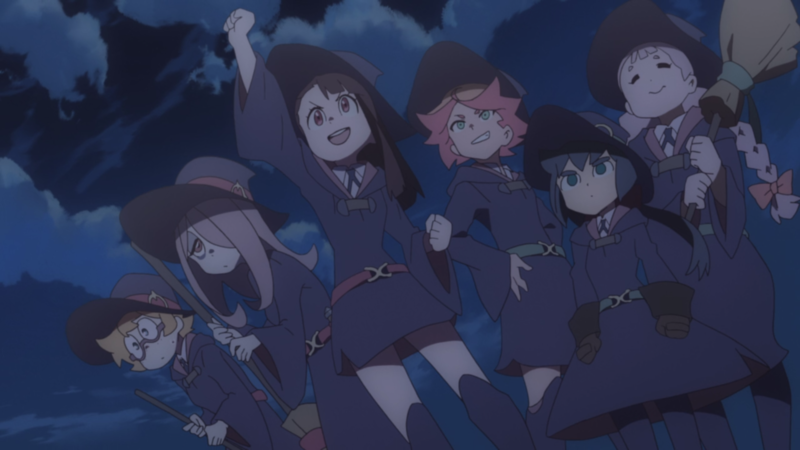 On that note, and just recently, I finished Little Witch Academia, Trigger’s famous and beloved anime from last year that won the hearts of many. A story about a girl’s dream to become as great a witch as her role model, the characters, the style, and the moments therein impressed me. However, like always, I took a keen interest in the “…and then some” part of my original statement. And so I wished to know: What is this anime really about on a deeper level? Theme Versus Motif: Which is Which? Be it in literature, film, video games, or anime, many stories often have an underlying idea at their core. Using proper terminology, this element is commonly known as a theme. Think of a theme as a way for a story to unify itself and to deliver a message. In other words, if the audience asks themselves, “What ties this story together, and what is it trying to tell me?”, then the answer can almost always be found in the theme (or themes) this tale contains. As for Little Witch Academia, it contains its own important theme to answer those questions. Indeed, the show lays it out rather plainly within the first couple of minutes of the very first episode. Meaning, it’s not exactly a difficult concept. Nevertheless, simply realizing a theme isn’t enough. The story must also explore it to a reasonable extent. How is a theme explored, then? Well, through the use of a separate yet related concept known as a motif. Where a theme forms the core of a story, motifs help to explain what that theme happens to be. In other words, “A motif generally reinforces the theme of the text”  (or in this case the narrative of this anime). Motifs can be dialogue, characters, or even specific actions, and their recurring, changing nature enlighten the audience on the story’s theme. Spotting them does require practice and an attentive focus while watching. But, even on a subconscious level, motifs create the dots that the audience connect together to eventually lead them to that all-important theme. 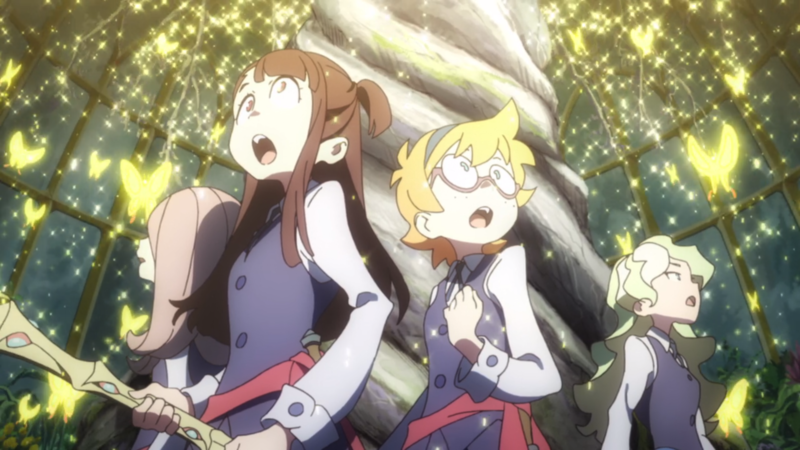 Thus, to understand and to appreciate the efficacy of the theme that Little Witch Academia carries throughout the series, its motifs must be analyzed. While many motifs exist within the show, they more or less fall under three distinct categories: the words said, the friendships had, and the emotions shared. In real life, communication is key. That means using the right words at the right time to describe an object or simply hold a mundane conversation. Without words, people would be unable to express themselves to any nuanced degree, relying on yelps and growls of a primal nature. 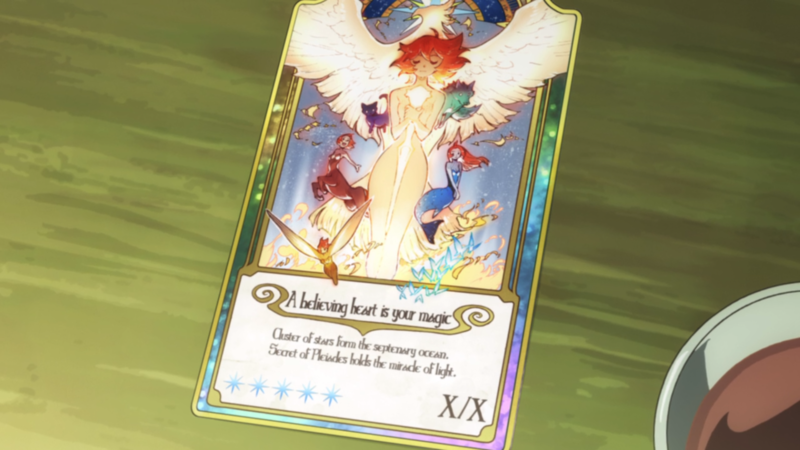 In Little Witch Academia, words mean more than just a tool for speaking to a fellow witch, for they give the students and the teachers the means to perform spells. “Metamorphie Fasciesse” causes the user to transform into a different animal. “Tia Freyre” allows for flight on a broomstick. And so on and so forth. But the anime (as Sucy may put it) takes it a mushroom further. Words become a vital plot element once Akko begins her quest to awaken the full potential of the Shiny Rod and to unlock the ultimate power in the Grand Triskellion. That is, words themselves become a motif that push the story along due to their constant presence. Through this motif, the anime gives itself a strong stepping stone for its episodes as they keep their focus sharp. Each word introduces a new idea, a different conflict to overcome, and ultimately a purposeful takeaway that marks the progress made for Akko’s personal journey. So, the “magic” here is the words themselves. Communication with words requires a second party. That may be a stranger on the street or a close family member at the dinner table. Sometimes, though, it’s someone in-between. A person whose chance encounter went above mere acquaintances after similar hobbies and fun times aligned. Otherwise known as a friend. These episodes standout due to their individualized nature, but the friendships throughout make for a notable motif in the anime. For it isn’t so much that Lotte wins a quiz game or Constanze turns that ship into a mega robot. It’s about how Akko works with them all to solve the problems that they face through their sincere bonds. One of the most important parts to this friendship motif takes the form of the star pupil of Luna Nova: Diana. Diana is a constant character in the story, and she mirrors Akko in more ways than one. They start off annoyed with each other. Then they grow into “rivals” of sorts. And finally, after Diana’s personal episode about choosing her own path, the two become fast friends. Altogether, this motif demonstrates that life is easier, better with friends nearby. 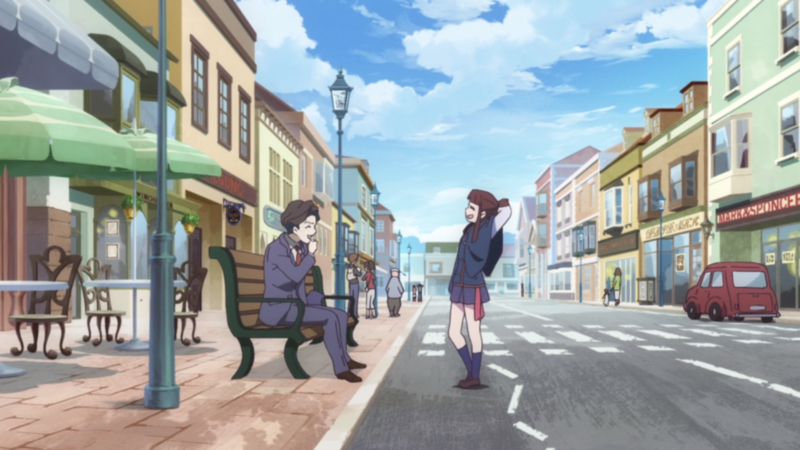 Akko’s varied friendships not only improve the connectivity of the show but also give her in turn the help she needs when she needs it most. Because, without them, she would never be able to reach the heights she so often strives for. So, the “magic” here is the friendships themselves. While words and friendships can exist on their own, they lack impact without emotions. Happiness, sadness, anger, fear. Such feelings change how a word is delivered or how a friendship is made. Most importantly, they generate the flow of a given situation. 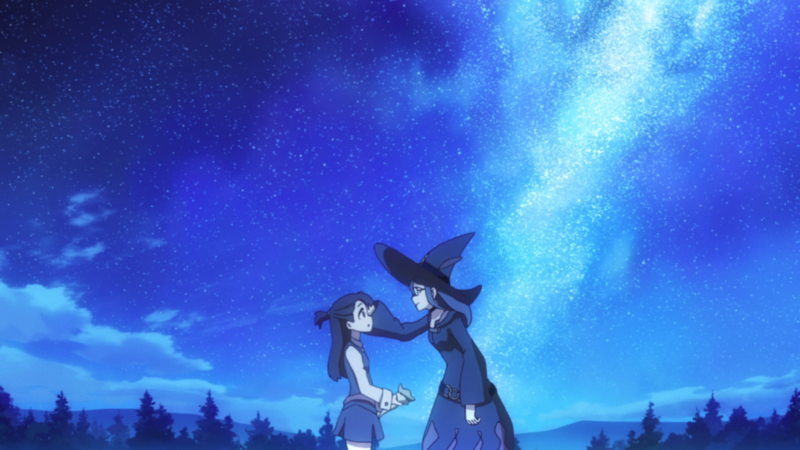 Little Witch Academia could have been content with only using emotions to bolster Akko’s comedic timing or to increase the drama of a scene with Professor Ursula. Instead, the anime takes this element and raises it to worthwhile status by making it yet another motif. This motif exists readily in the political and the school subplots. Emotions run high and do not subside after a soccer match’s outcome, and the professors at Luna Nova remind the audience on occasion that witches have started to dwindle lately in terms of presence and usefulness. The show then combines these two sides to create the main antagonist for the second half of the season in Croix. She’s a technological genius and Chariot’s old friend. She also channels this motif on emotions. She harnesses the negative thoughts and feelings of non-witches to power her devices while simultaneously taking advantage of the witches’ troubling predicament. All the while, Andrew’s character, similar to Diana, follows this motif as well. He at first embodies discontent for witches and their spells. His feelings slowly move towards positivity and eventually outright advocacy, though, because of his frequent interactions with Akko. 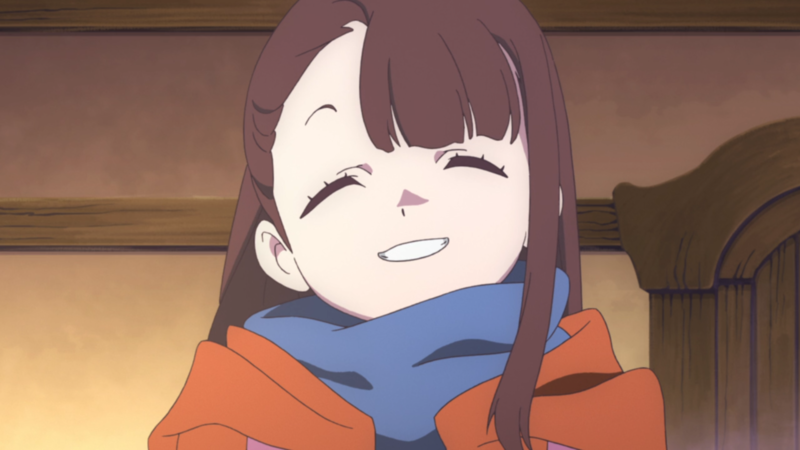 For Akko, unlike anyone else in the anime, champions unbridled optimism, exuding the opposite emotions that he, Croix, and the many other characters experience. Akko’s drive to never give up and to never give in manifests as a belief in herself and the people around her. Her good emotions beat back the bad ones, and, as a result, this motif permeates the anime with a happy, wholesome atmosphere. So, the “magic” here is the emotions themselves. Words, friendships, and emotions. Now armed with an understanding of these motifs within Little Witch Academia, it becomes possible to fully appreciate the thoughtful theme that forms the foundation of this anime. That theme? Those motifs and this theme exist across the entirety of Little Witch Academia, but they culminate in the very last episode. Chariot’s words turn into a call to action the world over. All of Akko’s close friends, one by one, push her forward in their own way. And people from different nations, cultures, and walks of life literally send their positive energy and emotions to her and Diana, hoping that they will succeed. Is it all rather on-the-nose during this closer? Perhaps a bit. But it doesn’t stop Little Witch Academia whatsoever. Rather, it makes for one last opportunity to understand the dots laid out for us to follow. To discover that straightforward yet meaningful theme that this charming anime provides in wonderful fashion. To repeat a way-earlier point, these discussed motifs are not the only ones located in the show. Akko’s (lack of) broom skills, Diana’s bully friends, and the trading cards collected are more examples within the story that interweave its main theme. And said main theme is up for interpretation. People may find a different message buried within, and, so long as the motifs argue in its favor, it will be just as valid as the one discovered here. A theme is a central idea that a story creates to deliver a message. To understand this theme, the story’s motifs guide the audience along. Their different shapes and recurring nature form figurative dots that, when connected together, lead those attentive enough to the core of a tale. Having now seen Little Witch Academia and understood its theme, don’t let it go to waste. Tell your parents you love them. Call up your buddy and ask if he or she needs any help. And spread some positivity where you can. For you, too, have the “magic” within to brighten somebody’s day!